Emilija’s experience: In the beginning of this year’s summer I traveled to the northernmost SPIE Student Chapter in University of Oulu, Finland to attend the Summer School on Optics & Photonics. It was organized as a joint effort between the Optoelectronics and Measurement Techniques (OPEM) Laboratory, Oulu BioImaging (OBI) Network, University of Oulu and ITMO University. The main areas covered were photonics, optics, optoelectronics and bioimaging. Members of our Student Chapter were kindly invited by the Oulu Student Chapter to visit as well as have the chance to present their latest research and I took them up on the offer by presenting a poster titled “Non-invasive evaluation of skin pathologies by RGB autofluorescence imaging” at the conference”. The summer school events lasted 3 days from June 1st to 3rd. The first day coincided with another University of Oulu based event - Oulu Bioimaging Day, organized by the Oulu BioImaging Network. It is part of a larger nationwide and Europe-wide network which consists of many research facilities and medical centers. The goal of it is to coordinate transition of advancements in research into the medical field. For this reason most of the lectures of the first day were around medical imaging. Professor Zeev Zalevsky of Bar-Ilan University of Israel talked about a very interesting method of “listening” to far away sounds by analyzing nanovibrations of a laser beam, claiming that you could measure the pulse of person from even 90 meters away! Jerome Thevenot of University of Oulu on the other hand talked about the prospective uses of thermal imaging, for example, finding a person who might have returned from an overseas trip with a contagious disease in a crowd of people at the airport. By surveying fellow attendees, however, the most interesting presentation by far was by Dr. Ronald Sroka from the University Hospital Munich in Germany. He talked about the use of photo-dynamic fluoresence and photo-dynamic therapy (PDT) in brain and prostate surgery and showed a very interesting video of a brain surgery utilizing fluorescence for surgeons to observe how much cancerous tissue there is left to extract. In between the talks the poster sessions also took place. In the evening everyone was invited to a lavish dinner and, of course, sauna! The second day talks were much more technical and discussed optical phenomena in-depth, for example, Jussi Hiltunen of Technical Research Center of Finland talked in great detail about Raman scattering and Raman spectroscopy, as well as its mathematical background, while Pawel Wierzba of Gdansk University of Technology of Poland taught us all about polarization interferometry. Matti Kinnunen of University of Oulu talked about optical tweezers and their measurements with red blood cells (RBC). This technology is important in studying optical properties of biological tissues because it allows observing a single cell without damaging it. The principle is that a strong laser beam provides an electric field which holds a dielectric particle in a slightly displaced position from the beam’s center thus creating a trap for DNA, proteins, bacteria etc. After the talks the Ph.D. students were able to ask questions to representatives from various companies working with optoelectronics and optics to find out what they needed to start working in the industry. Next we had SPIE/OSA chapters meeting where the president of the Oulu SPIE Student Chapter told us about what they have achieved since their founding. Me, on the other hand, gave a presentation about our own SPIE Student Chapter and our activities during the last year like the awesome Developments in Optics and Communications 2017 conference and our demonstrations during the European Researchers’ Night 2016. We also got the chance to explore the laboratories in the University of Oulu. The third day took off with a talk by our very own professor Jānis Spīgulis, who talked about the research we do at the Biophotonics Laboratory in the Institute of Atomic Physics and Spectroscopy, specifically about hyperspectral and multispectral imaging of the skin. However, he also mentioned the research I presented in my poster, as well as Marta’s research she presented in Tampere. At the end of the day awards for best talks and posters were issued and an Oulu city tour was organized. The guide tried to show us as much a possible but it was not summer at all - we were all really cold. So for the rest of the evening we retreated into Cafe Kuluma in the centre of Oulu where time was spent discussing the events of the Summer School of Optics and Photonics and creating friendships. If you are interested, you can see the rest of the presentations here. All in all, I had a great time at the event. I think that this is a good way to learn more not only about progress in your own field of research but about other fields of optics and photonics as well. There were a lot of discussions on various scientific topics between seasoned researchers and aspiring scientists which makes it an event that every student studying in the field should attend! My favourite event was the city tour because by that time everyone had already become acquainted which made for a very relaxing and fun atmosphere! Big thanks to the main organizers of the event! I hope they learned a lot from this experience which will allow them to organize even better events in the coming years. I would also like to thank ULSPIE for sponsoring this wonderful trip! 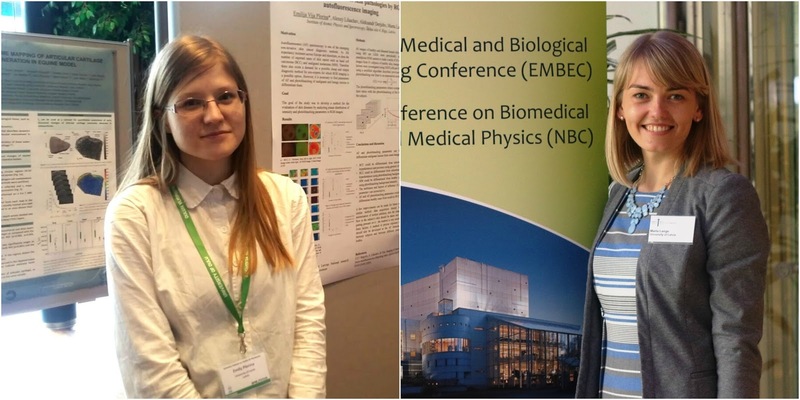 In the mid-june one of SPIE University of Latvia Student Chapter member Marta Lange had the chance to attend and present her research at a conference for biomedical engineers and healthcare professionals: EMBEC and NBC 2017 in Tampere, Finland. What is more, she successfully participated in Young Investigators Competition. This was a joint conference of the European Medical and Biological Engineering Conference (EMBEC) and the Nordic-Baltic Conference on Biomedical Engineering and Medical Physics (NBC). In grand meetings like this one, there is a wonderful chance to network and to meet other scientists who are passionate, talented and good at what they’re doing. Marta is a PhD student in Biophotonics Lab in the University of Latvia, her research field is non-invasive skin diagnostics methods with various biophotonics techniques. In this conference she presented the recent study on how to evaluate regional anesthesia effectiveness by using optical methods, for instance, remote photoplethysmography (rPPG). The study was done in a clinical setting in Hospital of Traumatology and Orthopedics. There was a pitching event for students called “Young Investigators Competition” where each of the 10 finalists had to go on a stage and in only 4 minutes describe their research to the conference attendees on a coffee break. Basically, like an idea pitching where you have to sell your idea to investors. Marta got Third Prize in this competition presenting her solution for operation rooms in hospitals: an optical remote system for regional anesthesia effectiveness evaluation.